What determines how cities move on? The ever-increasing challenges to urban mobility come in many forms, and approaches to address them range from the technically ingenious to attempts to change travel behaviour. Key amongst factors essential to the success of any such approach is whether the urban environment proves to be fertile ground for the desired progress. Another vital determinant of success is how well individual measures to engineer the transport system interact with other developments. This leads to the principal subject of Megacity Mobility Culture: the basic principles that determine the paths along which cities move. This book demonstrates that the concept of ‘mobility culture’ provides a framework for understanding the development of urban transport which transcends the boundaries between academic disciplines. 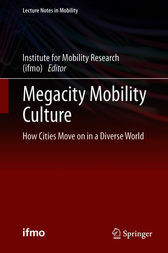 Based on a discussion of the diversity of megacities worldwide, it provides help in navigating the complexity of megacity mobility culture. Experts from megacities around the world each take the reader on a journey to their own city and its mobility culture, giving a deeper insight into the unique evolutionary paths of mobility that these places have taken, and what lies before them. Whilst acknowledging the overwhelming diversity of cities worldwide, the authors also identify common denominators behind the evolution of urban transport systems – seven temperaments which are found in a unique mix in any given city, defining the character of its mobility culture. The Institute for Mobility Research is a research facility of the BMW Group. It deals with future developments and challenges relating to mobility across all modes of transport, with automobility being only one aspect among many. Taking on an international perspective, ifmo’s activities focus on social science and sociopolitical, economic and ecological issues, but also extend to cultural questions related to the key challenges facing the future of mobility. The work of the Institute is supported by an interdisciplinary board of renowned scientists and scholars, and by representatives of BMW, Deutsche Bahn, Lufthansa, MAN, Siemens and The World Bank.